Gladys Fay Gilder Byrd, daughter of Benjamin Barnard Gilder and Rachel Emma Johnson, married to Albert Berry Byrd and buried in DeLeon Cemetery, DeLeon, Comanche County, Texas. 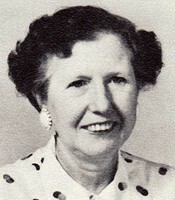 Lawn Independent School District High School Teacher (1956-1957). First Jim Ned Consolidated Independent School District Eighth Grade Teacher (1957-1970).